At some point someone definitely used too much pressure on the heel. 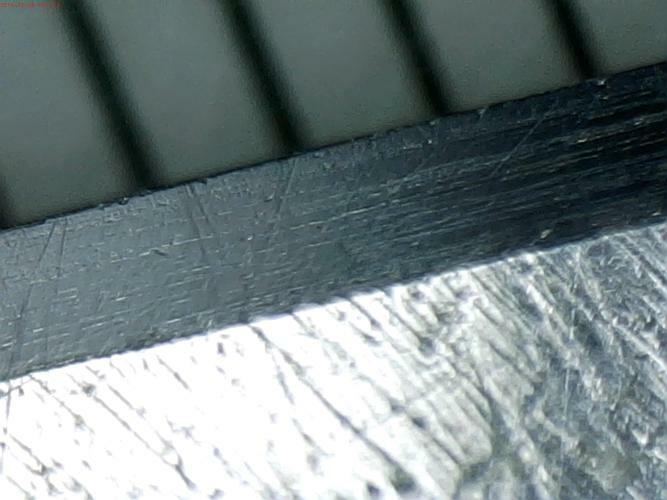 That first pic also shows what I view as microchips, and I've never seen parallel striations like those. If it were me, I would drop back to 1k - maybe with a layer or 2 of electrical tape on the spine - and reset the bevel. Hopefully that would eliminate both the microchips and the excessive heel wear. But that may be overkill, hopefully someone with more knowledge/experience will chime in soon. Just my thoughts, take them for what they're worth. Aldwyn, pcm, FAL and 1 others like this. Hi PCM, I agree with Marshal, drop back to 1K, 2 layers of tape and re-set the bevel and at a 45* angle joint or breadknife the edge Lightly, you may have to do that a couple of times to get the nicks out of the blade and at the same time you are aligning and leveling the edge. Today I used the hard plastic rim on a disposable drinking glass, worked perfect in that application, it will also take off a wire edge better than wood, end or cross grain. PCM, have you got together with a mentor or another honer in your area yet? It would really help you I think, it will all come together for you soon, stick to it and another thing I saw was you need to get the lower grit marks out completely before moving up to the next higher grit stone. Hands on instruction would really help me sometimes but I have learned many things on my own and never regret a minute of it, the science of sharp has taught me a few things, read it close and study the pics, I did and had a couple small Ahh Ha moments. Maybe you will too. 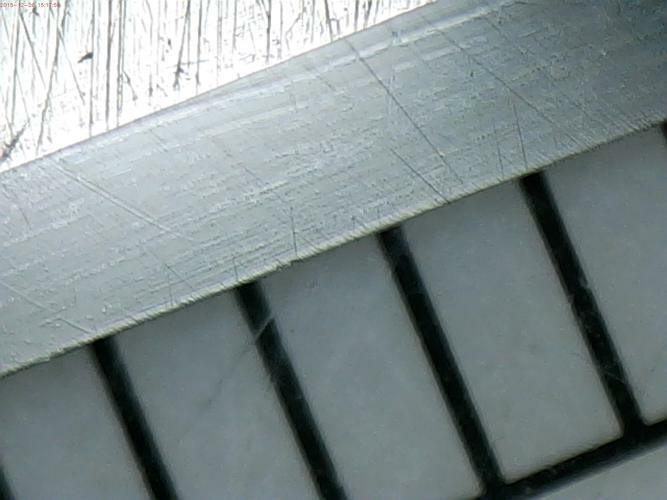 So, all you see is probably correct, except the horizontal stria… it is most likely not stria at all and just dried swarf on the bevel. Wipe the blade with a damp microfiber towel and then repeatedly with a dry paper towel. You will probably find all the horizontal lines gone. Yes, it need honing and full bevel set and when last honed was not honed to the edge. First fix that heel or it will become a spur and cut you. 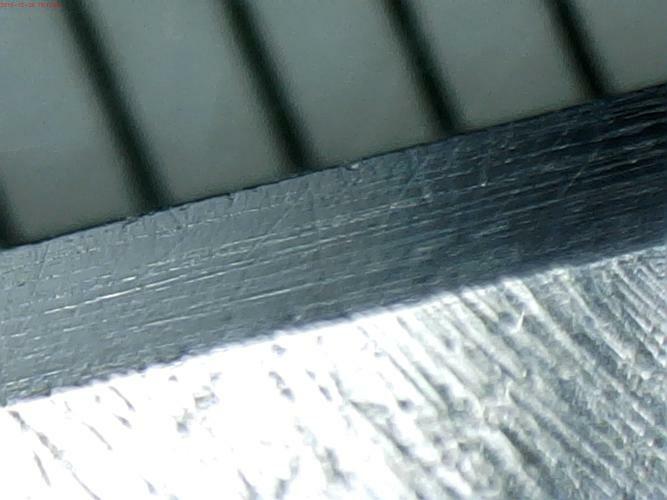 With a small coin, penny or dime trace the heel corner with a sharpie and grind the shape to the coin radius. Then put 2 layers of tape and set the bevel with a well lapped 4k, the edge will straighten out, though it will be narrower at the heel and bevels will join. Stay on the 4k until the bevels meet and all the deep stria is removed. MJC, IndependenceRazor1 and eKretz like this. 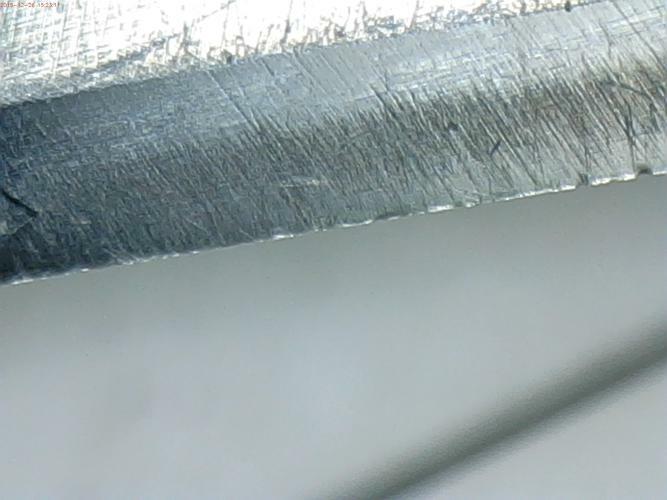 You have to remember that we are looking at the bevel at a very high magnification, probably at 4 or 500X. What appears to be major damage is really not that bad. 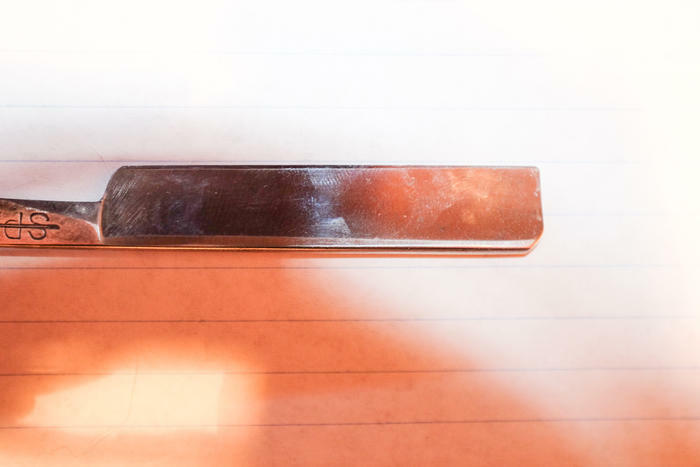 The bevel is not set in some spots, but with some tape will come together nicely and fairly quickly. 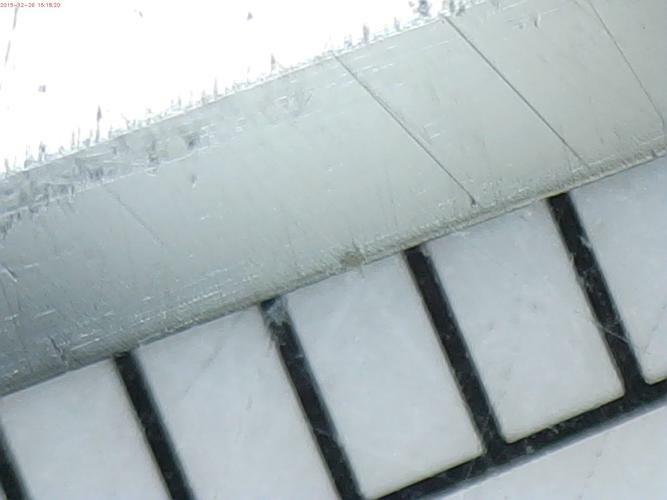 Also Union blades are very thin and should hone easily. The bevels are reasonably flat and very close to meeting. A 4k will easily re-set the bevel. The heel is the worst part of the job, but that can be corrected on the 1k. Last edited by Euclid440; 12-27-2015 at 12:10 PM. monkeypuzzlebeefeater and MJC like this. Yeah, likely me. When I tried correcting the dings, it was my first try at honing and I'm sure I did numerous things wrong. Months later I did another honing, with a bunch of advise from Euclid440, and it came out great, IMHO. 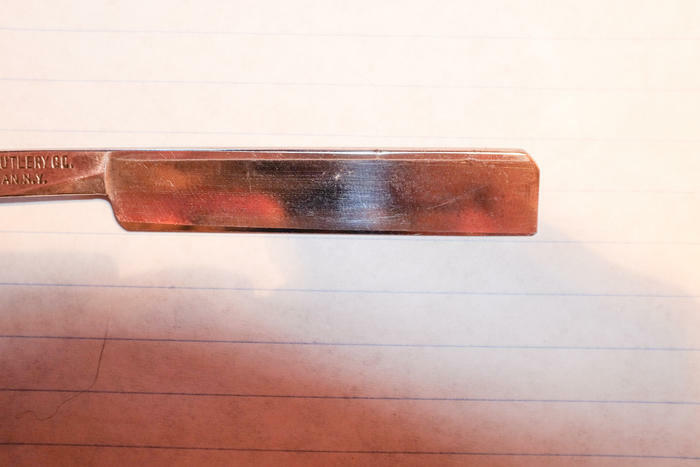 Looking to straighten out (sic) this razor now, but wanted advice so that I'd take a good approach, and went to the right level of stone. So, do like we did on the other razor and round that heel, and then go to the 4K to bevel set? Should I do a leading heel X stroke for bevel set or use circles initially? Will clean it better and see about the parallel lines. Yes, you can see from the photos, where the heel is much of your problem. Because it is so square the back edge of the heel is far back and when you hone, you are hitting the stabilizer and ridding up on it, keeping the heel off the stone. To compensate you are adding more pressure, (see excess hone ware on the spine and at the heel) and only exacerbating the heel spur. So round the heel, that will bring the edge and corner of the heel, well forward and away from the stabilizer and solve a lot of issues for you. You should be able to easily set the bevel and polish it on the 4k. Heel forward X stroke will hone the heel. pcm and MW76 like this. Hold on. There is no stabilizer on that blade and no drastic remodeling of the heel is necessary. I don't have time to write more yet but please don't do anything drastic to that blade in the next few hours. Do you notice that the bevel is uneven only on one side of the blade? nun2sharp and pcm like this. Either way, clearly you are riding up on it and keeping the heel off the stone. Reshaping the heel will prevent the forming of a sharp heel and keep the corner well away from the “shoulder”. Reshaping the heel is not drastic, you will lose a millimeter or two of the edge in exchange of a safer shaving razor.